Hello. 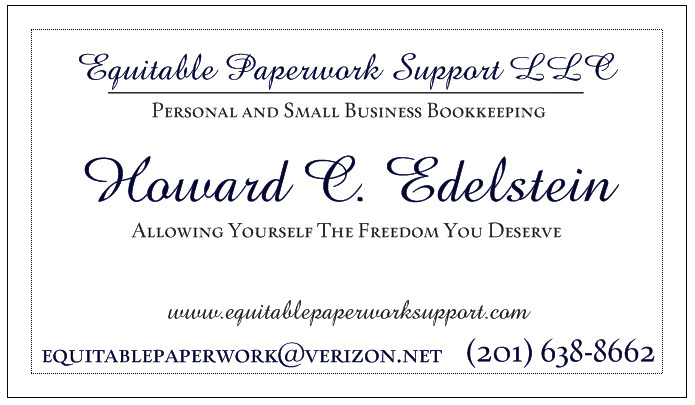 My name is Howard Edelstein and I am the owner of Equitable Paperwork Support LLC. Daily Money Management and Small Business Bookkeeping Services. I am a personal Daily Money Manager and provide financial services to senior citizens, people with disabilities, those with busy schedules and others that do not have time to allocate to their own financial paperwork nor to that of their elder family members. Whether it be paying bills, following up on health insurance, making deposits or anything pertaining to paperwork that requires attention, I can provide you with the assistance needed. I enjoy helping people and want to relieve them of the burden of paperwork, which can be both overwhelming and time consuming. I want to provide my clients the opportunity to lead a life consisting of simplicity and freedom. 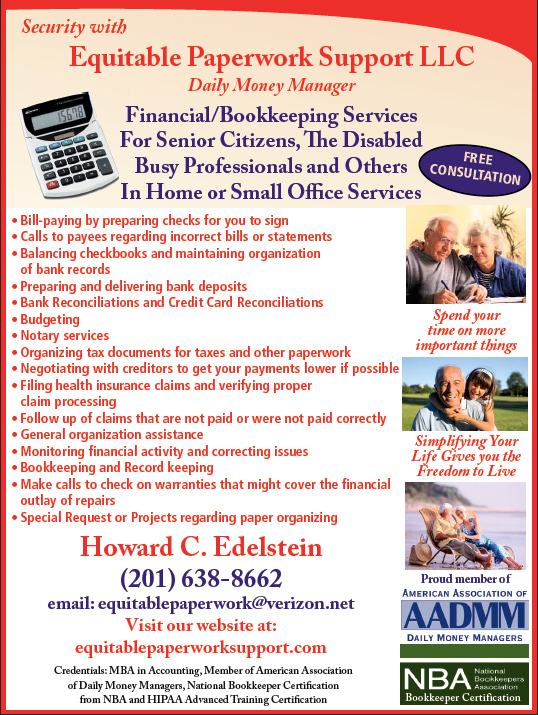 I also provide small businesses with bookkeeping and accounting services. I work on or off premises. I provide my clients with QuickBooks or other accounting software support. This includes setup and periodic bookkeeping or accounting maintenance. If you require bill paying, invoicing or other specific accounting functions, I will carry out those services as well. Prior to starting Equitable Paperwork Support, LLC, I have worked in accounting for companies and corporations manufacturing and retailing a variety of products. I held positions from Accounting Manager/Finance to Senior Accountant for a various companies such as English Leather Cologne. I have also worked in the healthcare financial field, where I was in charge of the financial aspect of the company, as well as overseeing the proper processing of claims. I am the HIPAA Compliant Officer and HIPAA Complaint Officer for a company, of which I have never received a complaint. 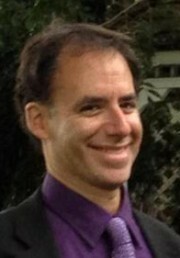 I have an MBA in Accounting and a Bachelor of Science in Business Management from Fairleigh Dickinson University. I was awarded a Master Certificate in Financial Management after completing courses and exams in Business Ethics, Economics and Finance. I have obtained an Advanced HIPAA Training Certification for HIPAA Awareness, Privacy, Security and HiTech. This certifies that any assistance I provide for you concerning filing health claims, claim follow ups, correction of erroneous information on claims, etc. will be held in the strictest confidence between you and myself. You can be assured that there are steep penalties for anyone who makes personal information public or shares this information without your consent. HIPAA exists for your privacy and security. I have National Bookkeepers Association Certification as I have passed the Uniform Bookkeeper Certification Examination. This certification is recognized throughout the United States and its properties. I am a proud member of the American Association of Daily Money Managers. As a member of the AADMM, I have sworn obligation to uphold a strict code of ethics that protect your rights and privacy, as well as provide you with services that are performed with your interests at hand. It promotes fair and honest business practices in every way. When I am not working, I enjoy spending time with my family. Whether it be baseball, hockey, music or anything else, I am there with them. Our favorite vacation spot is none other than Disney World.